DD5LP/P – March 12th 2019 – DL/AM-177 Kirnberg & DL/AM-178 Ammerleite. With constant bad weather from the start of March I wanted to get out and grab some Winter bonus points and at the same time make sure all equipment was working, before I was to meet up with Brian VK3BCM from Australia and take him to some SOTA summits. The previous week, I had travelled out to DL/AM-177 Kirnberg only to be forced to pack up after having got the antenna up, due to the high speed and bitterly cold winds. I had alerted for these summits a couple of days earlier but again with the weather had to postpone them. I was now determined to get these activations in as this day was forecast to be somewhat better (not that weather forecasts are to be trusted nowadays) In any case everything was put ready for an early start as the wife needed the car in the afternoon. I decided to concentrate on the tried and tested equipment, no testing any new equipment. As I approached Kirnberg, things looked fine (but they had done also the last time I was here). It was somewhat more muddy than last time as there had been heavy rain storms in the last few days. I grabbed the surveyors tripod, one of my 6 metre masts and my usual two bags (one with the radio, battery box and headphones and one with the antennas and other small items in) and headed up the hill to the cross and bench on the summit. All started well and the tripod allowed me to position the mast where I could run out the linked dipole easily in both directions. One end got tied off to the bottom of the concrete cross (I know not perhaps the best option but it’s there and would not be damaged by the cord) The other end ran down and was pegged into the ground. At this point the winds started – this summit seems always to be windy and cold! Well I quickly set everything else up and got on the air. 20 metres was totally dead and 40 metres not much better but I managed nine contacts in 25 minutes and while I needed to get the second summit in as well, I called it a day at this point, packed up and carried everything back down to the car and set off for Ammerleite, on the other side of the valley. The run to where I park my car for Ammerleite took about 20 minutes and this time, I decided not to take the tripod as I knew there were convenient fence posts that could support the mast and the ends of the linked dipole. So there was less to carry this time, thankfully. Set-up again on one of the two benches at this “Schnalz” summit and with the X108G connected to the smart phone so that I could see the display in what was now becoming a sunny day, and somewhat warmer than at Kirnberg, I was set to go. I didn’t even try 20 metres this time and concentrated on what was now a much better 40 metres. Signals were stronger with less QSB than at the previous summit. Starting at 11:10 local (10:10 UTC) I managed twenty contacts in twelve minutes! This is how the activations used to be! There were no DX contacts in the log however even though I did listen specifically for Ernie VK3DET with whom I had a sched hoping to manage a 40 metre short path contact as had been possible in previous weeks at around this time. Today this wasn’t to be though. Rather than continue trying and while the chaser calls had dried up, I decided to pack everything up and head home so that the wife could have the car a little earlier than promised. Battery box (2 x 5000maH hardcase LIPOs). Surveyors tripod (only used on Kirnberg). The propagation again wasn’t great but at least I managed to get two more “easy” summits off my list for the winter bonus activation points. The equipment worked reliably meaning once I recharged the battery, everything would be ready for the follow days planned three activations with Brian VK3BCM. All in all a good activation after the failed attempt a week earlier. The sunshine and little or no wind on the second summit was a pleasant change. The sudden high SWR indications occurred with this (known good) antenna as I had seen with the VP2E antenna on the previous activation, so I believe this is false data being sent from the X108G to the smart phone App (PocketRxTx) rather than there being a bad SWR occurring. DD5LP/P – March 3rd 2019 – DL/AM-176 Rentschen. There was little preparation for this activation as it was decided upon when the weather and radio conditions looked a little better, while those in the upcoming days were not looking very good. For the last few activations I have been trying to make a contact into VK or ZL – something which used to be relatively easy as long as one was on at the right time to use the Long path or short path window. In this case, as the decision to activate was taken after the long path windows was nearly over – the only option was to try during short path window around 1100 UTC. The closest summit where I could set up my new VP2E antenna up without any problems is Rentschen, the same summit that I couldn’t activate about 2.5 weeks earlier due to 1.5 – 2.0 metres of snow. I was hoping that most of the snow would have melted by now! Once I had decided to try an activation, I grabbed all the needed gear, in principle my two standard bags, my surveyors tripod, screw-in sun umbrella base and two masts as I planned to put up my 40/20m dipole as well as the VP2E. As I approached Rentschen, I could still see snow on the upper slopes but luckily when I arrived at the summit, a lot of the snow had gone and I could quickly find a spot to set up and I proceeded to put up the tripod, 6 metre mast and VP2E antenna set to direct its slight gain lobe in the direction of VK/ZL via short path. I was earlier than I expected on site but I decided the best action would be to start calling anyway to pick up the needed 4 contacts for me to get the activator point plus the three winter bonus points for the summit. Of interest, is the fact that the high voltage power lines that used to cross exactly over the trig-point / summit marker stone are gone! I presume they have been either buried underground or re-routed in some way. Although the sun was shining, the temperatures were affected by a very cold wind, which in the end would limit the time I would be on the summit. I had email contact with Ernie VK3DET and let him know that I was already calling, so he could try to listen for me. Unfortunately he could not hear anything from me – radio conditions were bad again. That being said I did make 8 contacts on what others reported as a “flat” 20m band. I managed two contacts into Finland, one into Norway, one into Portugal, one into Spain, one into the Ukraine and two into Russia. So the antenna does appear to work and the lack of contacts into the direction of the UK suggests some directivity of the antenna. I had planned to put my second antenna up however a lot of my time was consumed with calming down a dog who came up to the summit on its own from a house down the lane and continually barked at me until she finally got bored and went home. Putting up a second mast with the dog there may have caused more problems with the dog. In any case I decided that as I had got my required 4 contacts fairly quickly I would continue testing with the 20m antenna and trying to get that short path contact into VK. Unfortunately the VK contact wasn’t going to happen, despite 20 watts of SSB and the new antenna, propagation simply did not happen. To do proper antenna comparisons I think I need a second Op. along so that I can compare and log data and also get a second opinion of what is performing and what not. VP2E (Vertically polarised, 2 element, 20m wire antenna). The propagation seemed not to be very good with the noise level raised by yet another solar storm hitting the ionosphere. This was a risk, but at least I managed to activate and qualify the summit. The display on the X108G was again unreadable so I used the Smart Phone to view and control the rig. With a different cable configuration to last time I had less problems with the program hanging-up and leaving the rig on TX, but it did still happen. The VP2E antenna does appear to perform well, even though at one point the app on the phone told me that the X108G was seeing a 10:1 SWR but then the next moment it was 1.1 or 1.5:1. A bad connection perhaps? – Something to be looked at. I am happy that I was able to simply grab my gear and go as the weather for the following week is not looking very good. DD5LP/P – February 21st 2019 – DL/AL-169 Auerberg. After analysis of the activation of Peissenberg the previous week, I decided that part of the reason for no VK/ZL contacts was that from my operating position, for the signals to travel on the long path, they would need to pass though the church building – I needed to give this another try from a better summit. The Church at Auerberg and the land around it, which is the actual summit have been closed for some months hence I needed to find out if it was now accessible again before travelling there to find that I couldn’t set up. This summit is of interest as my location at the back of the church building is at the top of a steep slope dropping off roughly in a NNW direction, which is exactly the direction needed for long path into VK/ZL when a dipole is run along the top of the ridge. I contacted the local government through their website and was forwarded onto the church group, who told me that the church would only be open after the re-blessing ceremony, following all the renovation work, in April. I sent another note asking if the area around the church is once again open to the public and the reply was positive but with a warning that there was still a lot of snow up there. I’ve activated Auerberg in winter before, so I knew what to expect. Unfortunately the space at Auerberg is not enough to deploy the new VP2E antenna for a test and as 40m was more likely to deliver a contact, one of my dipoles (either the linked SOTABeams “bandhopper: or Aerial-51 UL-404 off centre fed dipole) would be better suited to be used for 40m & 20m. These two dipole antennas are always at the bottom of the small rucksack and so they stayed there, while the two VP2E antennas were removed. I also decided to give the troublesome DX-Wire 10 metre mini-mast another chance as the dipoles work better for DX the more height they have. (I’d also take the 6m Lambdahalbe mast as backup). As for supporting the mast, since the surveyors tripod had done such a good job in the snow on Weichberg about 10 days before, I decided, despite its size and weight, it would go along as well to Auerberg. As it turned out this was a good decision as the fence posts that I used to use were partly bent over by the weight of snow on them. Again Mike 2E0YYY was going to head out to a summit in the UK and he decided to take a vertical antenna for 20 metres and a dipole for 40m. We informed the usual hams in Australia who promised to try for a contact with one or both of us if the conditions allowed. So as this would be an even earlier start than last time (needing to be operational on the summit by 0700 UTC) all the gear was packed into the car the night before and the alarm set for an early start …. As with the Peissenberg activation the previous week I didn’t need to set the alarm as I was wide awake an hour earlier than I needed to be. I didn’t want to leave early as I would end up sitting around in the snow waiting for the long path window to open, so I actually left home at about my planned time. The trip down was uneventful and although I did have the GPS navi on, I didn’t need it having driven the route a few times previously. As I approached Auerberg, the snow at the side of the road started to get higher and higher and I wondered what would be facing me when I arrived at the car park (the kind lady from the Church group had told me that the road up to the car park had been cleared, which was indeed the case. Looking up to the church from the car park, I was relieved to see that someone had cleared the complete set of steps from the restaurant up to the church and when I got up there. A track around the church had also been cleared. I headed to my normal spot so that I could put the radios and masts down on the bench seats …. I couldn’t as they’re no longer there. The area at the back of the church was part gravel, part mud and also part snow. So the old reliable painters plastic sheet came out of the rucksack and everything was put on there while I took a look to see how I would put the antenna up. I had already decided to use the Aerial-51 OCF antenna for this activation to avoid the need to lower and raise the antenna when I wanted to change between 20m & 40m. Given that I had decided to use the DX-Wire 10 metre mast – lowering and extending that mast multiple times, with its habit of collapsing into itself, was to be avoided if possible. Before the mast and antenna could go up though the first action was to put up the surveyors tripod. This had to go again into the snowy part of the area and the spiked legs again did a good job. After the tripod was up, the mast was fed through my wooden plate that is permanently fitted to the tripod and then the antenna slid down onto the mast sections. Before extending the mast up, I ran the ends of the antenna out in the two required directions and the coax back to the painters sheet, where the radio would be connected up. Much of the fencing had been damaged by being pushed over by the weight of snow that had been present. It was still over one metre deep in places which made getting the antenna wire out where I wanted it, a little difficult at times. Up went the mast, I had just about guessed the positioning of the cords on the ends of the elements to two of the remaining upright fence posts so only a little adjustment was needed there. It was now time to prepare the operating position, so out came the Xiegu X-108G, its microphone, the battery box, my log book and pen and the smart phone and USB cable. I expected to have to use the smart phone to see the settings on the rig and change them when needed, but for most of the two hours that I was on the summit, the display on the X108 was just readable. After checking for any spots from other activators (the last shown were from hours earlier) I decided to set-up and start on 20 metres. 20 metres during this activation was a flop – I only managed one contact on 20m with Sergei RV9DC at a much lower strength than he normally is. 40 metres was the band to be on, although during the activation I went back to 20m a few times to see if there was any DX to work – there wasn’t. Only European nets it seemed. Even 40m didn’t deliver the hoped for DX, despite some close calls. At one point I could hear Ernie VK3DET but he couldn’t hear me. Then later he heard me but could break in, in between the European chasers, despite the fact that I specifically listened for VK/ZL stations on several occasions. The conditions were simply not good enough. I mentioned earlier that Mike 2E0YYY and I had planned this together and indeed I worked Mike for an S2S and for a couple of short chats. We ran one frequency between us at one point (for about 30 minutes) which caused some confusion with the chasers calling me Mike on a few occasions and I had to explain who they were actually working. I suspect Mike’s self spot on the frequency was after mine and hence was seen more easily. Towards the end of the activation, I had a visit from a couple from Garmish Partenkirchen who had come out for a walk and the views. He knew something of what I was doing as he had been a TV repair man before he retired. At the end of the activation I ended up with 29 contacts all from around Europe and as my location was shaded from the sun, I also ended up very cold until I got back down to the car, which was sat in the sunshine reporting +9C. I believe at my operating location it would rarely have got over the freezing point. For this activation, I had only planned to try the long path. To have waited for the short path would have been another 2-3 hours after I packed up because of the cold and I would have had to again transmit through the church building, this time for the short path direction. 10 metre DX-Wire fibreglass “Mini-Mast”. The propagation seemed to be one-way at times and with the Plasma hitting the Ionosphere still at the time of the activation, it would have been surprising to make any contacts into VK or ZL. It was strange to hear absolutely nothing from New Zealand. I was surprised by the DX-Wire mast. For once it held up through the complete activation and the surveyors tripod was certainly worth the extra effort of taking it as it made the setting up of the antenna very straight forward indeed. 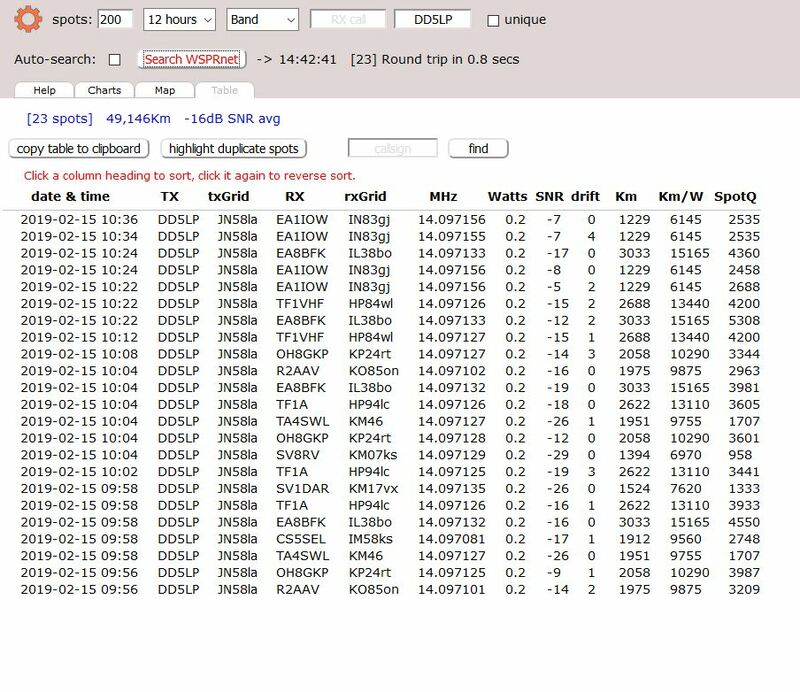 Although Mike was running 50 watts to my 20 watts and is at least one “skip-hop” closer to VK/ZL than I via the long path, he also managed no contacts “down under” so it simply wasn’t to be on this occasion. Although the display was (just) readable on the X108G I did use the Smart Phone to set or change parameters as the small rubberised buttons on the X108G itself are difficult to use – especially in the deep cold. After changing cables and adding more ferrites, since the last outing, the USB link between the rig and phone worked fine on 40 metres but when I changed to 20 metres the link failed often and many times left the rig on Tx after I released the PTT switch. Some noise still comes from the phone into the X108G’s receiver. More work needs to be done on both of these problems. DD5LP/P – February 18th 2019 – DL/AM-001 Peissenberg – another 40m long path attempt. Following the debacle the previous week where I got to my summit 30 minutes after the 40m long path to Australia had closed, I decided to go to a summit, where I knew I would not be delayed in getting there and could be set-up well in time for any chance of contacts into VK/ZL. The chosen summit was one of my more local summits – DL/AM-001 Peissenberg. This is a drive-on summit with its own car park and a road that is kept open as it also leads to the governmental weather monitoring stations. I decided to rely on a known antenna, mast and radio and would use my normal location at Peissenberg, despite the fact that for long path I would be firing directly through the church which sits on the very summit. It has worked before, so why not again – not the perfect set-up but a reliable one that I knew I would be on the air with in good time. Everything was packed and ready to go the night before and the alarm set. I didn’t need to set the alarm as I was wide awake an hour earlier than I needed to be. Preparation to leave home was therefore a casual, rather than a rushed action. Although still cold initially once the sun was to come out, things would warm up. Despite that I went with my winter jacket but before the activation was finished I had taken it off and even just in the sweatshirt I was feeling a little warm. The sunrise occurred while I was driving my, well-known by now, route and after arriving parking and walking the 500m to the usual set-up point, looking across the valley I could see the last of the sun rising into a blue, almost cloudless sky. This hasn’t happened on my activations for a long time, but sure enough – it was a wonderful few hours in nice sunny weather and no longer sub-zero. A real spring-like day. I soon got the mast and SOTABeams linked dipole up with the links set for 40 metres – this was going to be a 40m only activation. One of my first contacts was Mike 2E0YYY on “Gun” in the UK, he had a good signal this time – the previous week, I couldn’t even hear him. The contacts flowed early on and via email I knew Ernie VK3DET was listening but not hearing Mike or myself. Between the European contacts I specifically took a listen for VK/ZL stations and at one point I heard what I think was a ZL station but not strong enough to work them. 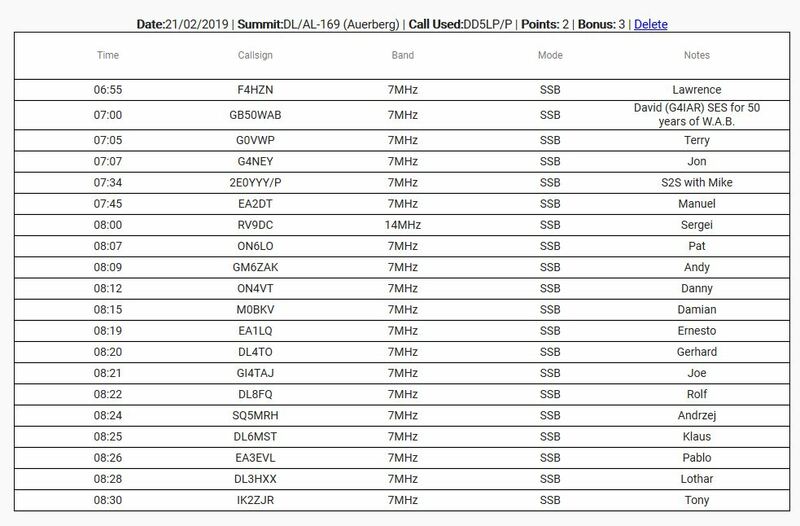 I also listened in to Mike’s QSO with John ZL1BYZ and could hear him fine, unfortunately when Mike asked him to listen for me, he could not hear me. At one point I could hear Ernie VK3DET calling Mike but not strong enough for me to try for a contact. 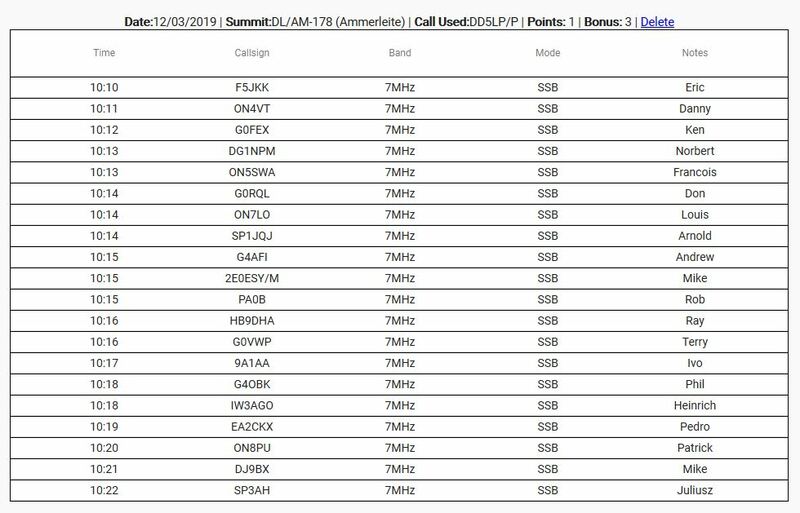 There was a lot of QSB on the band and I had to move a couple of times due to QRM from stations on nearby frequencies. added to thi the fact that my remote control USB connection would lock-up leaving me the only option of turning the rig off and back on was annoying to say the least. The fact that it was a beautiful sunny morning and that I did in fact get 39 contacts around Europe made it a nice activation however just one contact into VK or ZL would have made it perfect. 6 metre fibreglass “Squid Pole”. The propagation wasn’t there to enable long path contacts for me on 40m. Perhaps 20m would have been better? Perhaps being at the other side of the church would have increased my chances? Although having the display from the radio’s functions on the smart phone screen is a big improvement, the fact that the USB link is susceptible to RF causing lock-ups will need to be addressed asap. DD5LP/P – January 1st 2019 – DL/AM-060 Laber. With the new year, activation points for already activated summits are reset. After having to cancel two activation attempts in December 2018, I wanted to get out and activate ASAP in 2019 and chose Laber as my target summit. It is a simple summit to access, not too far to drive and worth 6 points (plus 3 winter bonus points). The weather looked OK, so access, which is simply via a cable car and a 3 minutes walk to the summit should be fine. The equipment would be the XIEGU X108G, battery box and headphones with the standard 6m mast and two wire dipoles as backup but the intention was to use my tripod and the Kommunica HF-PRO-2 antenna that had worked well at Hinteres Hornle in November. A new addition this time is a small USB cable and USB-C OTG (“on-the-go”) adapter as I intended using the PocketRxTx remote control software and my Smart Phone so that I could see the frequency and other settings on the phone which become invisible on the XIEGUs 2″ OLED screen when there is any sunlight. In addition to the small rucksack and a photo bag this time I would be carrying a plastic water pipe that I have converted into a holder for the HF-Pro-2 to avoid the antenna getting caught up on anything (or anyone) which was an issue at its last outing. As my intention was to try for some short path contacts into VK around 10:00 UTC a departure from home at 10am local time (09:00 UTC) was planned. Laber is the mountain located above Oberammergau, which is famous for its Passion Play every 10 years. It’s just under an hours drive from my home to the car park of the cable car (which is the oldest still running in Germany). After the, about 15 minutes, ride up in the cable car, the summit is only 3 minutes walk from the “top station”. There is a convenient seating bank where I usually operate from. Some activations just don’t go smoothly! The journey down to Oberammergau went without incident and the ride up the Laber mountain in the cable car was enjoyable, chatting with some tourists from Dortmund. On arriving at the summit, it was in the clouds and my planned activation bench, was under several inches of snow. After cutting some steps into the snow to get safely to the bench, I set to with clearing the bench with an ice scraper that I had brought with me for just this purpose. The HF-PRO2 antenna went up on the tripod with its legs about 50% down into the snow. The top was a little “wobbly” something that will need to be addressed. It was difficult to get the 8 radial wires out over the snow while balancing on what is a knife-edge ridge line, so I threw them out in two bunches of four in opposite directions and hoped that would be OK. Although this was less than perfect putting up the fibreglass mast and linked dipole antenna with the deep snow would have been very difficult. This is exactly one of the situations why I have the simpler vertical antenna / tripod set-up. The next problem was that for some reason my self spots were not getting through to SOTAWatch, I switched phone networks (I have a dual SIM smart phone) but that didn’t seem to make any difference. During the whole activation I only got two contacts, one on 20m with Sweden at 5-3 and one on 40m at 5-5 into Holland, so although I was getting out it seems either people weren’t calling me or I wasn’t hearing them. So no activator points and after 45 minutes my fingers were frozen despite having some good quality gloves with me as I had to take them off every time I wanted to do anything. I set the loading coil on the HF-Pro2 by my measurements that I had made at home as the SWR trace feature on the XIEGU rig was totally invisible on its built-in 2″ OLED display. OLED displays have a problem to be seen outside, why XIEGU ever changed from the TFT screen that had brightness and contrast controls I’ll never understand! So in any case the antenna probably wasn’t exactly on tune. One of the things that did work (sort of) was using my smart phone (which has more than enough brightness in its display) as an external display – actually it runs the PocketRxTx remote control program so not only did I use it for displaying the frequency but also for tuning and switching bands and side-bands, oh and yes for adjusting the power and pre-amp / attenuator settings as well. Practically that was a success …. except the USB cable kept coming out of the bottom of the phone and RFI was transferred down the USB cable to the rig bringing up the noise level (which could be the reason I wasn’t hearing weaker stations calling me). So I came away with more things to fix than contacts in the log. There’s still some work to do to get to the “perfect” solution. In the end the elements were getting to me and I decided not to keep fighting to see if I could manage to get two more contacts and packed up after just 45 minutes. Oh well I’ve now got a reason to go back to DL/AM-060 Laber once I have “fixed” the problems to try again to get the summit and winter bonus points. Xiegu X108G and battery box. Kommunica Power HF-PRO-2 loaded vertical antenna. Water pipe carrying tube for vertical antenna. USB OTC cable and PocketRxTX software on my smart phone. The Good: The use of the smart phone to display what the rig is doing works but needs some fine tuning, and additions such as enabling the SWR reading feature. The Kommunica HF-PRO2 antenna, despite probably not being correctly tuned still managed to get a signal out and set-up and take down times are very good even in several feet of snow! The Bad: The Smartphone is causing QRM across the bands and needs to be further away from the rig. The power supply no longer causes QRM since I changed to a diode matrix instead of the “buck converter”, so replacing QRM from one source with QRM from another is not a good idea. The Ugly: Loose physical connections both on the USB cable into the phone and the PL-259 base on the tripod. I have ordered a new connector/OTC adapter for the phone and will glue the top of the tripod to be solid as the only adjustments needed can be made with the legs, photographic accuracy in level mounting of the base of the antenna is not needed. 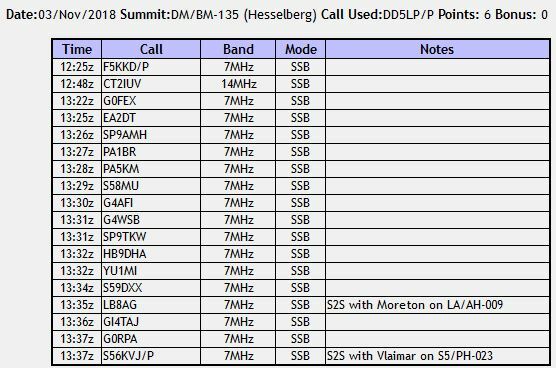 DD5LP/P – November 3rd 2018 – DM/BM-135 Hesselberg (NA-EU S2S) an activation that was more of a demonstration. I decided that Hesselberg would be my summit for the big EU-NA “Transatlantic” S2S event. After the activation on the previous Thursday, this one is a “walk in the park” to get to from the car park. 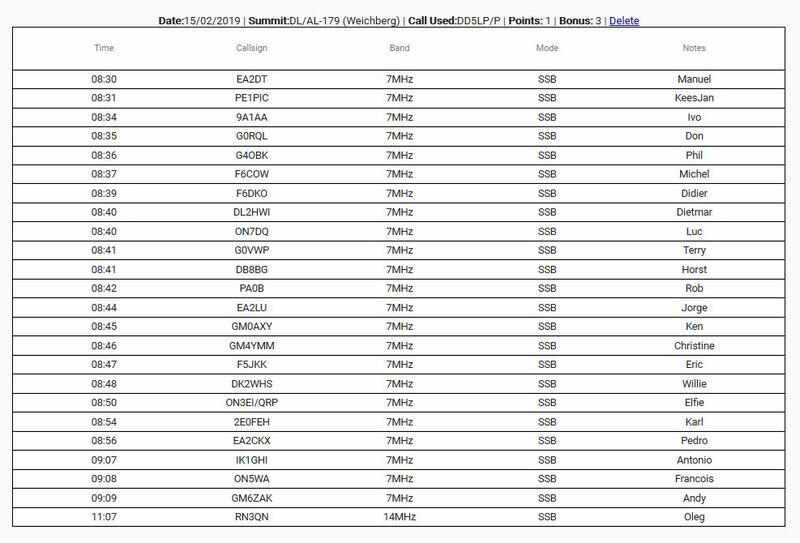 Having had some success with two NA contacts from Hinteres Hornele, I was hoping conditions would hold up not realising the “small” contest that was on was actually the Ukrainian DX contest and it would cause problems. I had decided that the new Komunica HF-PRO-2 plus tripod would be my primary antenna for 20m with the standard SOTABeams linked dipole covering 40 metres for me, as well as being a back-up for 20m. The rig would be the X108G again and I was not expecting any sunshine from the forecast, so maybe the difficulty of reading the display on this (marketed as an “outdoor” transceiver) rig would not be a problem (wrong!). After my experiences on Hinteres Hornele, I was back with the two backpacks. The camera case with the rig, battery box and headphones in it and my small rucksack with the wire antennas, to which I added my three J-pole antennas from Lambdahalbe (20m, 17m and 15m) – well you never know! I also put the 10m DX-Wire portable mini-mast in the car as I would need that if I decided to use the 20m J-pole. So again, I’d be taking more than I need but I could leave the heavy things in the car and pop back for them if I needed them at this summit. Hesselberg is a 6 point summit, so I hoped it would be attractive to the chasers and especially other activators looking for an S2S contact. Timing-wise, given the 2 hour drive each way, I’d need to be leaving by 3:30pm local to head back home before it gets too dark. Based on this, a departure from home at 10:30am local would give me sufficient time on the summit, if a little earlier than ideal for EU-NA contacts. Hesselberg is located north of Augsberg and about half way between Ingolstadt and Stuttgart. It has the advantage that having a Radio transmitter mast on top of it, there’s a road almost all the way to the top. It is also in an area where access to the summit for walkers is well-defined. There are even disabled persons spots in the car park, making this summit a possible for disabled operators although some help getting up the last few metres to the summit would be needed as it’s a rough track. At the summit, as well as the standard cross, there is also a mini-cross and a trig point stone along with two information boards and a table with bench seats at each side of it. The drive was uneventful and the weather clear and it stayed that way on arrival for a change. I was actually able to take some shots from the summit that weren’t just clouds and fog as they had been in the last two visits. After leaving the car park and heading up to the summit, I could see this was going to be a busy summit. The table and benches were occupied but as I approached, I was lucky, they were just leaving. There were also some other people standing around enjoying the view but they indicated they didn’t want the table, so I unloaded both packs, mast and HF-PRO-2 onto the table and set to putting the vertical antenna together. At this point I got asked what I was doing and I stopped to explain something about Ham Radio and gave out a brochure. This was going to be the pattern all through the activation. I spent more time explaining the hobby thank being on the air. The HF loaded whip was set up quite close to the end of the picnic table and the 6m mast got fastened to one of the information signs and the linked dipole put up. One end of the dipole ran out nicely into some bush land. The other end unfortunately ran out into the open area. Later one woman tripped on it (despite it being bright yellow). She didn’t hurt herself, apologised and asked what it was all about … I put the peg back in and went through my explanation again. The worst visitor was one unruly young girl who despite being told by her teacher or parent (it was a big group) continually kicked at the antenna guy peg until it came out (bent). I was not happy but there was little I could do! To their merit another family group had three young ladies probably between 9 and 12 years old and they politely asked if they could sit at the table and asked polite questions and they were a pleasure to talk with. They were learning English at school but didn’t try any with me, the conversation was in German – but I think they’ll have a story to take back to school about meeting the crazy English man with his radio talking to people in other countries. Their parents also got one of the DARC brochures that I had luckily thought to print out on Friday. Somewhere in between all the explanations, I did manage to get on the air. First I tried the HF whip on 20m – I could hear lots of stations as there was the contest in full swing but from the start of the activation to the end it was very, very difficult to read anything on the X108G display and while it was light, there wasn’t any bright sunshine. I could hear lots on the whip but all of the stations that I called and my CQs never received any answers. So I switched to the wire dipole and changed the links to cover 20m. to find …. I could hear lots of stations but no one came back when I called them! I started to wonder if I had hit one of the buttons on the rig and something wasn’t set right – but I COULDN’T READ THE DISPLAY! Perhaps it’s 20m? So I switched to 40m. and I managed to get through to F5KKD/P – this was my first contact after over half an hour on the summit! I was starting to think I wasn’t going to even get the needed 4 contacts to get the points for this summit, never mind any S2S contacts NA or EU! I went back to twenty metres to see if I could hear any of the other SOTA activators who by this point were on their summits – NOTHING and this using the trusted linked dipole. Conditions seemed to be going up and down but this was worse than I had seen for sometime. Had the solar winds already hit? (I found out later – no, we were lucky and missed those). Another 20 minutes, some more instruction on Amateur radio to visitors and then CT2IUV replies to my spotted CQ call (oh yes while using Vodaphone the Internet connection was questionable and I was unable to spot, despite the fact that the phone was showing 3 bars and a 4G indication – once I realised and switched to the other SIM to get a Deutsche Telekom 3G link, everything worked fine). Another half an hour passed by which time it had got cold on the summit and my departure time was fast approaching. 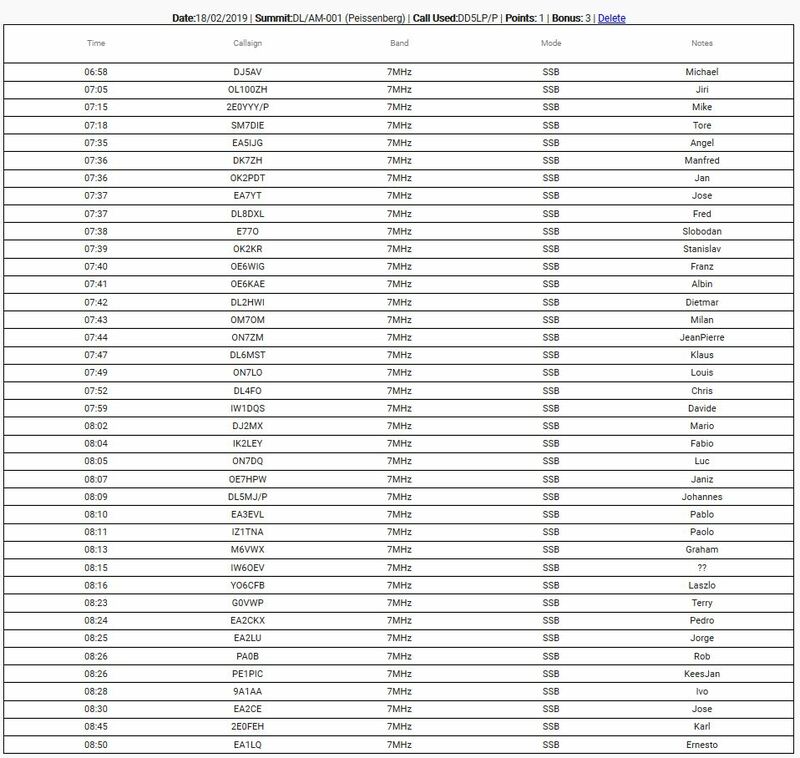 This was starting to look like a failed activation, then all of a sudden I got a stream of calls on 40m – 16 contacts in 15 minutes. Once the calls stopped, it certainly was time to pack up and while packing away the HF vertical, the clip for the radials broke from its wire (I don’t think this will have affected the performance as it was still hanging by a few wires I guess), but who knows and also the wire to one of the links in the linked dipole broke – this one I think could have affected the dipole antennas performance as would have the number of people stood next to the wire and that unruly female offspring kicking the peg! LambdaHalbe “End Fed Half wave” (J-pole) antennas for 20m, 17m & 15m (not used). DX-Wire 10m portable mast (not used). The good: I did mange two S2S contacts (albeit this side of the “pond”) and qualified the summit. The battery box with it’s diodes replacing the “Buck” converter worked without RFI problems again. The Bad: The continuing problems with not being able to read the rigs display! The suspicion that perhaps one half of the antenna was not fully connected on 40m. The Ugly: That little brat-ess kicking away at the antenna! In fact trying to operate from a summit when there is a contest on and it’s a summit that is easy to get to and so is crowded. The variation in the conditions and the fact that apparently, some better conditions arrived after I had packed up.